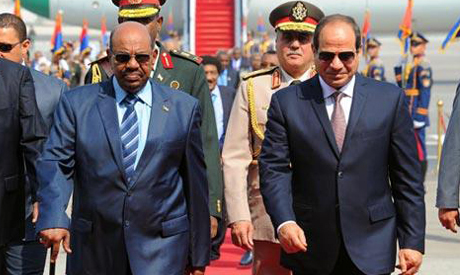 Egypt's President Abdel-Fattah El-Sisi and Sudan's President Omar Al-Bashir signed a comprehensive partnership agreement on Wednesday in Cairo during bilateral high committee meetings, Al-Ahram Arabic website reported. Fifteen memoranda of understanding were also signed on the sidelines of the meetings in various fields including commerce, education, tourism, economy, transportation and agriculture. El-Sisi awarded the Sudanese president the Egyptian army's Order of Honour Star for his participation with Sudanese army units in the 6 October War in 1973 and the War of Attrition after 1967. In opening remarks during the ceremony, El-Sisi said that "a comprehensive strategy between the two countries shall enhance cooperation and further progress in all fields." He added that Egypt and Sudan face similar regional and international challenges, stressing the importance of cooperation to counter "extremism and terrorism." This is the first time since 2011, when the committee was founded, that the two presidents have headed its meetings. In previous years, the proceedings were chaired at the prime ministerial level. The Egyptian-Sudanese high committee consists of sub-committees for military affairs, policy and security, economics and finance, transportation, education, culture, health, water resources and agriculture. The Egyptian president stressed Cairo's support for all efforts to achieve peace and stability in Sudan, adding that Egypt will exert its utmost effort to support Sudan's sovereignty and prosperity. On his part, Al-Bashir called for strengthening bilateral cooperation within a practical framework and mechanisms to maintain the security of the two countries, given the regional circumstances. Sudan's president added that the meetings were "positive" and reflect the "special" bilateral relations between the two countries.